Well, we're officially down the rabbit hole, reviewing a game exclusive to a loyalty programme. 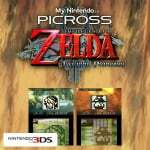 You can't buy My Nintendo Picross: The Legend of Zelda: Twilight Princess (a snappy title), you can only earn it with Platinum Points on Nintendo's loyalty programme. Easily done if you have social media accounts to link and dabble in Miitomo, less so if those criteria don't apply to you. Nevertheless, it immediately stands out on the service's early Rewards list courtesy of being exclusive content. At 1000 Platinum Points it is, for early adopters and those with access to Miitomo, easily picked up. Those tackling the most 'missions' may have accrued enough currency within 24 hours of the service launching, and it's a fairly generous offering in the 'engagement'-based Platinum category. Specialised and tying into the recent release of The Legend of Zelda: Twilight Princess HD, it nevertheless offers plenty of puzzles as a reward for loyal usage of the My Nintendo programme. What's immediately striking is the effort made in delivering a quality audio-visual experience. 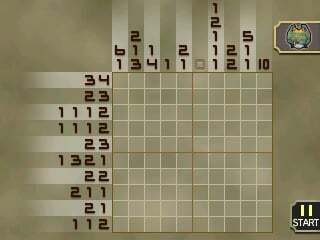 When first booted up the game assumes you've never played Picross before and walks you through five optional puzzles. Midna is the guide, making soundbite noises along with the feisty sort of text dialogue that fits the character nicely. These tutorial levels are certainly helpful, while also setting the tone for the limited but charming presentation of the broader game. Gameplay is as expected for anyone that's played one or more of the various Picross titles on 3DS, which is no surprise as Picross e developers Jupiter produced this title. The puzzle itself and the grid are on the touchscreen, and you can use the stylus or button inputs for filling squares or marking an X. The top screen shows the puzzle in progress, along with a visual backdrop from Twilight Princess. There's a surprising amount of content here, and the tie-in to Twilight Princess isn't phoned in with only pleasant background music and wallpapers - the puzzles themselves tap into nostalgia for the game and broader series. The designs and items resemble recognisable parts of the home console adventure, and look rather charming in their blocky Picross form. Clearing a puzzle within 60 minutes (avoiding time penalties for incorrect entries) in order to unlock the colour image becomes the key objective as a result. Beyond the obvious effort to play up to the Twilight Princess theme, Jupiter has included plenty of content. Picross and Mega Picross have 45 panels each to solve - the former is the standard mode, while the latter has some number clues that incorporate two rows or columns for some extra challenge. That's plenty of hours of entertainment for puzzle and Zelda fans, with panels ranging from 10x10 to 20x15. The larger puzzles can be a little fiddly when trying to tap a specific square on the smaller 3DS or New 3DS models, however, and there's no zoom option - on the flipside you can use physical controls if you want a little added precision. Hint options are also optional to give you a start in a puzzle or to highlight rows that should have your focus. This release also includes one Micross panel. This is a large image that is formed by completing 57 smaller puzzles, and provides some nice variety and extra content for the most eager players. Judging a loyalty programme game like My Nintendo Picross: The Legend of Zelda: Twilight Princess is tricky, as it's not actually 'for sale'. Considering the My Nintendo economy, and the fact this is a Platinum Reward that's well within the grasp of those fortunate to have Miitomo available in their country, it's a strong offering. We can quibble about the lack of a zoom option that would help on smaller 3DS models, or perhaps even over the limited number of backdrops. Yet ultimately we're looking at well over a hundred puzzles (including the Micross panels) that are nicely structured and tie into Twilight Princess, with a stylish presentation and plenty of charm. As the first ever My Nintendo exclusive game it delivers, and sets the bar high for its likely successor. I was disappointed that the Mega Picross puzzles have the same solutions as the normal Picross puzzles, but it's still a fun (kinda) free Picross game. I'll probably get this, if it's still available after getting some other Platinum rewards. @Moon How exactly can you get 120coins per week? Weekly Login Miiverse 30+EShop 30+Mynintendo 30=90 points. I'm going to get it when I have enough points,since it's the only reward that interests me. Is there an option to turn off the penalties? Just wondering. Eh, at least I still have the original DS game in case I run out of time. @LegendOfPokemon Penalties as in getting time added if you make a mistake? Yes, you can turn that off. @TheY You actually also get 30 Platinum Points when you weekly log onto Nintendo.com with your Nintendo Account. It doesn't show up anywhere except for your points history (not as an actual mission), so if you've gone onto Nintendo.com on your Nintendo Account recently, check your points history and you'll see it. If not... go get those freebies! @Moon @Moon Oh I didn't know I can get coins for loging in at Nintendo.com. Also, for those on the hunt for extra coins there are 'Hidden Missions'. So far only one has been discovered as far as I'm aware. To find it you need to click the Mario block at the bottom of the My Nintendo page, your Mii will then be holding a present. Keep clicking it and after about 20 clicks you'll get 10 coins. @CapricornDavid You may still have enough time to get both to be fair! What are the ways to get 120 coins? Then refresh your My Nintendo and you'll have 30 extra coins. On the upper left of the My Nintendo page, click Menu > Points History. It'll show you it worked there. @Moon I use Miitomo frequently, so I'm counting on it! I picked this up its a very good game! It is on the same level as the picross E titles just less puzzles. A great time killer on public transport. It expires on August 1th, while Wario Ware Touched ends on july 1th, enough time to grab it too, well and those 3DS home themes. @Moon oh, I didn't know about that fourth one either. Thanks for pointing that out! 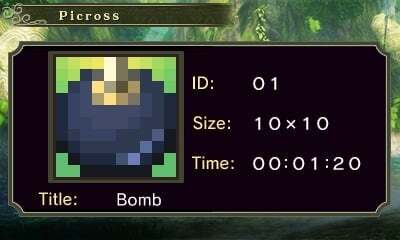 I'll pick this up on Monday once I did the weekly logins. Never played one of the other picross games, but since it's pretty much a freebie I might as well try that stuff now. Found a secret mission for platinum coins. Go to the bottom of the screen, click on the block, then youir Mii is holding a present box, click on them as they move around. This has been a fum distraction from HWL. I love the theming. And you can get 70 coins a week on Miitomo even with no friends. 5 per day for changing clothes and 5 per day for answering 3 questions. Takes less than 3 mins per day! So 190 per week easy. Unless I get a smartphone soon for Miitomo, I'll be able to play this sometime early next month. I'm hoping to get both this and WarioWare, but I'm probably going to get WarioWare first (never played Touched before). Usually I'd be concerned with saving my coins, but since they only have a shelf-life of 6 months on My Nintendo, it's basically use them or lose them. I'm eager to see what rewards are added in a few months (it looks like they'll have a quarterly rotation), and if it will become increasingly easy to earn Platinum coins as they release more apps. So much better than "Ultra Hand". Looking forward to getting Zelda Picross once I get enough points. It's a great reward. I also almost have enough gold coins to get Super Mario Land 2 on the Gameboy virtual console so looking forward to that too! Can't wait to play this but I need a 3DS first! Thankfully you have six months after you redeem the points so if I get a 3DS towards Christmas I'll be okay. I do wonder what'll happen if the NX is released this year. I wonder if these games be transferable to the NX, assuming it's a hybrid system. Should also point out that you can earn 335 coins a week, so it could take you a week to earn 1000 coins and then another three weeks to earn the next 1000. I'm trying hard to get the platinum coins for this game. About 5 weeks to go, if I count that Donkey Kong theme that is going to expire. Can't wait to get this. I just got a seriously sweet deal: New 3DS XL, with Ocarina of Time, Majora's Mask, Super Mario 3D Land, New Super Mario Bros 2, Mario Kart 7, Kid Icarus Uprising, and Star Fox 64 3D for only $170. Should arrive this weekend, but I've already saved up enough points for this game. I love picross, so this (and all those games) should keep me busy for a long while. I was wondering if there would be a review. Definitely getting this now, lol. PLUS free 10 coins laying near your coin box every week to pick up. @JaxonH I think (for whatever reason) when you sign into My Nintendo once a week, those coins aren't added until you pick them up from by your Mii. I bought Zelda Picross though I've not played it yet because I suddenly got back into Pokemon Picross. Hopefully they'll eventually make this and Wario Ware available to buy with traditional money for those that can't get enough Platinum points. Picross is of course really great stuff for puzzle lovers but this Zelda themed version is a treat for the great Zelda music and Midna sounds. Yeah, I got it a few days ago & it's really good (already done everything in the "Picross" & "Micross" sections. Now just working on "Mega Picross"). I'm saving up for the Mario 3DS theme, now. Should have enough by tomorrow. The name is quite loooong. 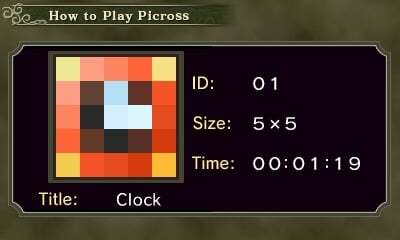 I got Picross DS back in the day. The theme of this game is oddly specific. Why didn't they just make it LoZ Picross? Mega Picross reuses the panels from the regular picross. Whenever I hit a 1000 coins I am getting this. I was waiting for a review of this game and now that I see that is actually quite good I will be redeeming my points on this one! Hopefully I have enough for the Mario theme too! Would be like 3 and a half weeks before I could get this now =w= got Wario ware and a Mario suit, so I guess I got something to look forward to hopefully. @Tsurii @TheY @Moon, That's a little miss leading , you don't get 30 platinum coins for signing into the nintendo.co.uk page and it IS in your Points History log. Any Nintendo website is fine, be it : .ca .com .co.uk any will do. You simply need to visit said webpage while logged in to your account. +120 platinum coins just like you were saying. @TsukiDeity That's what I said. I might get it, but I still think 1000 points is much for such a small game (Some people say the mega-picross puzzles are the same images). In a couple of weeks I have 1000 points, so who knows (I have 680 at the moment). @manu0 Just marketing to promote Twilight Princess HD recent launch. @TsukiDeity So do you get points for signing into on my.nintendo.com and any official Nintendo website? @VanillaLake Yes you get the points for simply logging into your account. You can log into your Nintendo Account from either my.nintendo.com or any official Nintendo website. BUT if you sign in through my.nintendo.com don't forget to check out the official nintendo website otherwise you'll miss out on the other 30 coins. @TsukiDeity But you only get 30 points for both things or 30 for signing in to My.Nintendo.com and 30 more for signing in to the official Nintendo website (e.g., Nintendo.co.uk)? Because I just did both things and only received 30 points for visiting Nintendo.co.uk while logged in to My.Nintendo.com. @VanillaLake Did you check your Points History log? You get 30 coins for logging into your Nintendo Account, regardless of where you sign in (you should find these coins laying in front of you coin boxes). The other 30 coins are obtain by simply visiting Nintendo.co.uk while logged in (I think they are automatically added to your total). Check your log, and if you don't see "Completed: Visit the official Nintendo website while signed in to your Nintendo Account (weekly)". Then try logging in both ways. I've got 3 account, including a Japanese one (all linked to NNIDs), so I'm going to check multiple methods to get those 30x2 coins on Monday when the week resets. I'm only getting 30 points for visiting the "official Nintendo website" but I don't know it that is My.Nintendo or Nintendo.co.uk because both are official Nintendo websites. If I understand what you're saying, I should get another 30? It appears that the wording for the UK and CAN are different. Could be either from that wording. But it should be the same though. Try signing in to My.Nintendo.com then visit the Nintendo.co.uk AND Nintendo.com (just to be sure). Then sign out and sign back in to your account on the Nintendo.co.uk or nintendo.com site (not from my.nintendo.com a second time). @VanillaLake I tested it. It works either way. The signing into My Nintendo, will give you 30 coins but they are placed in front of your boxes. You must "collect" them. The other 30 coins for visiting the official webiste (it's the official Nintendo.co.uk in your case) however, are automatically added to your pile of coins, there is no coin to collect, there is no "congrats" for getting it. All that happens is that you coin number will have gone up by 30. I was the same for my Japanese 3DS and visiting Nintendo.co.jp. If you still don't see anything, my last recommendation would be to note down you coins sunday night. On monday, sing-in in to My Nintendo (watch you coins they should be the same). Pick up your coins (note that down), then visit Nintendo.co.uk, then check you My Nintendo again (your coin sum should have gone up by 30). @TsukiDeity Wow, this took me a while, but you're definitely right. I could only get the last 30 because last week's coins had disappeared. @Moon Thank you for the tips! I just got either WarioWare or Zelda Picross a week early! @chiefeagle02 No problem my friend I have already got both games and both themes too, I really hope they add something new soon! For anybody who is planning to play this with a stylus: the slippery touch controls (at least on an original 3DS) can be a real freaking nightmare, so you may just end up using the regular buttons.